The We Need Diverse Books campaign is challenging its supporters to pledge to read a certain number of diverse books this year. I am pledging to read 5o. What qualifies as a diverse book? As the campaign challenge puts it: “Books where people of color can be first-page HEROES rather than second-class citizens. Books in which LGBTQIA characters can represent social CHANGE rather than social problems. And books where people with disabilities can be just…people.” I’ll also be making sure a majority of those books are also by diverse authors. The campaign focuses on children’s literature, and the majority a large portion of my diverse reads will probably be picture books, but I will also be counting adult books, like “Half a Yellow Sun” by Chimamanda Ngozi Adichie, which I read at the end of 2014 and highly recommend. Ngozi Adichie gave a TED talk on the critical misunderstandings created when we only hear one thing about a person or a place. It’s called “The Danger of a Single Story,” and it is also very worth your time. I have some other goals for my kidlit reading this year in addition to diversity. I hope to share them in the coming days or weeks. What are your 2015 reading goals? Please share them in the comments! I will be joining Kara in this pledge. 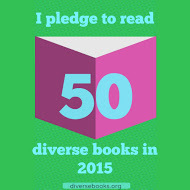 My Goodreads pledge is to read 100 books in 2015. This new resolution in support of #WeNeedDiverseBooks means half of my books read will represent diversity in all its strength and story.